When a bubble is suspended in liquid it is surrounded by oppositely charged ions. The surrounding of the nano-bubble exists of two parts. An inner, nearby region called the Stern layer where the ions are strongly bound and an outer diffuse region where the ions are less firmly attached. The outer region is like a cloud kept together by electrostatic forces, it consists of various ions of opposite polarities. The whole system forms an electrical double layer. The development of a net charge at the bubble particle liquid surface affects the distribution of ions in the neighboring inter-facial region. This results in an increased concentration of counter ions close to the surface. When the nano-bubble moves trough the liquid, ions within the boundary move with the bubble. Any ions beyond the boundary do not move with the bubble. The boundary we call the hydrodynamic shear or the slipping plane. The potential on this surface is called the zeta potential. The Zeta potential can be measured in mV. Zeta potential measures the magnitude of the electrostatic charge repulsion or attraction between particles, bubbles or droplets. 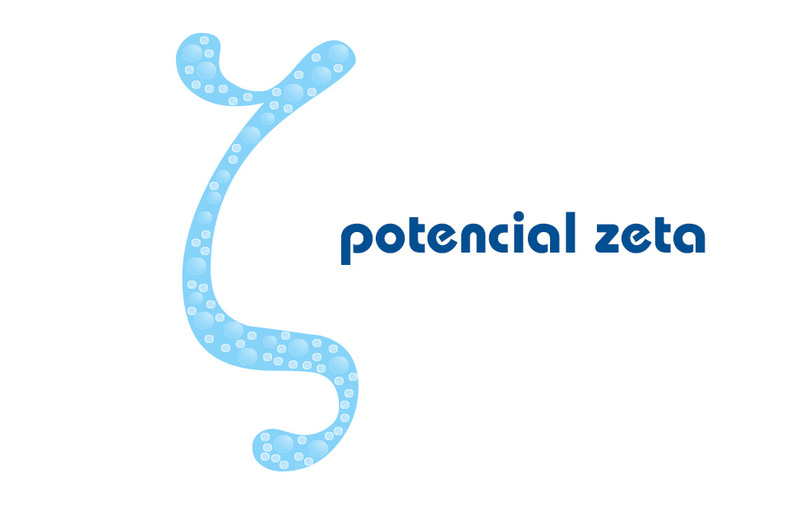 Zeta potential is one of the fundamental parameters to affect stability. 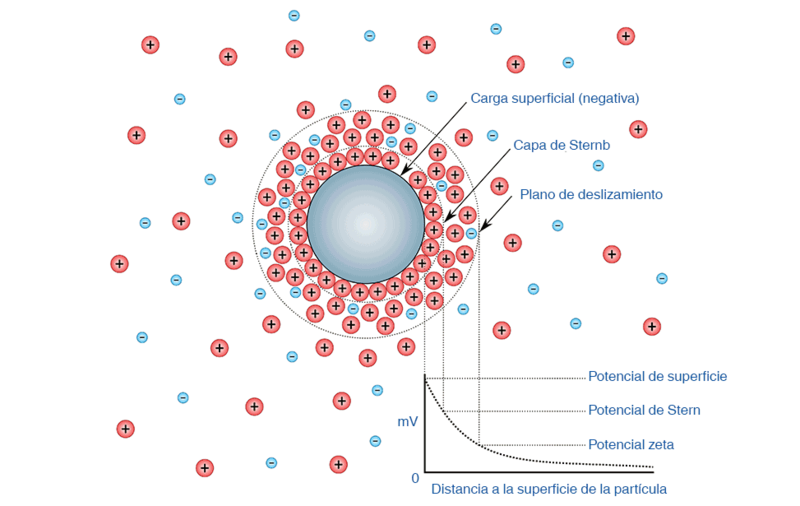 Zeta potential gives detailed insight into the causes of dispersion, aggregation or flocculation, and can be applied to improve the formulation of dispersion's, emulsions and suspensions. Higher zeta potential means stability to nano bubbles in suspension due to repulsion among the bubbles. A lower zeta potential leads to coagulation and is less stable. A lower Zeta Potential means a value closer to zero. The Zeta Potential is either positive or negative and a high zeta potential can be either a high positive or high negative number to be stable. The charge of the solution depends on positive ions H+ or more negative ions OH-. Studies have demonstrated that bubbles in distilled water are negatively charged. On average a bubble in distilled water has a zeta potential of -35 mV at a pH of 5.8 when measuring different bubble sizes there is no relationship between the magnitude of the zeta potential and the bubble diameter. When H+ and OH- ions are at play the pH is also present and is an important factor so when measuring the zeta potential always do this in combination with the pH. When the zeta potential is negative, the gas-water interface is negatively charged with OH- ions. The water has an excess of OH- ions compared to H+ ions. The negative value of the zeta potential under a wide range of pH suggests that OH- is more effectively adsorbed to the interface than H+. Sometimes the zeta potential is positive, this happens i.e. under stronger acidic conditions i.e. when CO2 gas is dissolved. Researchers explained the adsorption of OH- onto the interface by the difference of hydration energy between H+ and OH- or by the orientation of water dipoles at the interface with hydrogen atoms pointing toward the water phase and oxygen atoms towards the gas phase, causing an attraction of anions to the inter-phase. The gas-water interface electrical charge is related to the hydrogen-bonding network of water. The electric charge of the interface in the aqueous solution is caused by a greater excess of H+ and OH- at the interface than in the bulk. These ions are the essential elements of the hydrogen-bonding network therefor the structural information of the gas-water interface must include a greater number of these ions at the interface than in the bulk aqueous phase. As the negative value of the zeta potential for bubbles in a wide pH range suggests that OH- is more effective than H+ at influencing the microscopic structure of the gas-water interface. Alcohol both methanol, ethanol and higher alcohols have a negative impact on the zeta potential by reducing the negative value. The alcohols tend to absorb the gas-water interface, and adding a small amount of alcohol significantly disturbed the hydrogen bonding network at the interface. For the stability of bubbles some older research found that air bubbles were stable in solution for 4 days while CO2 bubbles lasted only 1 or 2 hours. More recent studies showed that ultrafine bubbles in a laboratory under perfect conditions are stable for 4 to 6 months. People often wonder, if ultrafine bubbles spread evenly through the water or if they are clustered in one region of the water. As bubbles behave the same as particles in a colloid. A colloid is a solution that has particles ranging between 1 and 1000 nano-meters in diameter and are still able to remain evenly distributed throughout the solution. These are also known as colloidal dispersion's because the substances remain dispersed and do not settle to the bottom of the container. Each colloidal particle dispersed in the solution is electrically charged due to their ionic characteristics and bipolar attributes. A high zeta potential means a stable solution for plant roots this is positive as they can more easy absorb nutrients due to a higher chance of absorption. A nutrient solution for plants with a low zeta potential shows clustered nutrients which are less accessible for plant roots. Probiotic bacteria are an important component for waste water cleaning, lake and pond remediation and septic tank cleaning. The probiotic bacteria are aerobic, they require oxygen as an energy source and the more oxygen the better. A probiotic bacteria is sized between 200 nm to 10,000 nm compared to an average acniti nano bubble between 85 to 120 nm. The probiotic bacteria accumulate nutrients from the environment by diffusion. A high oxygen concentration in the water with a high zeta potential helps these positive bacteria to thrive. With a high zeta potential the nutrients for the probiotic bacteria are well dispersed through the solution and makes them easy accessible. When the water solution has a low zeta potential nutrients are clustered less accessible and it will take more time for the probiotic bacteria to clean up the water body. 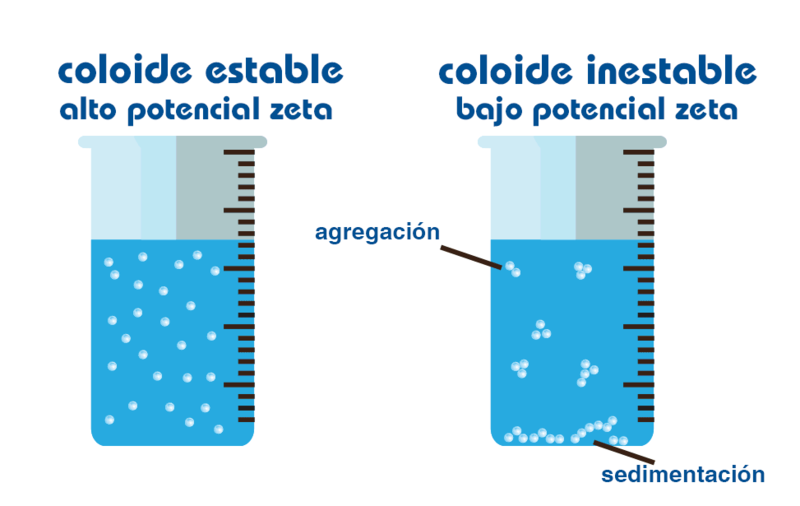 In water treatment system monitoring of the Zeta potential gives an indication for the amount of chemicals or ultrafine bubbles that need to be dosed. The increase in zeta potential of tubes and pipes eliminates bio-film and bio-fouling of membranes and extends filter life. Stabilize clay and other particles in water reducing the tendency for aggregation so they do not settle as soft-sludge. When fine bubbles are compressed at high concentrations, the zeta potential will increase during compression, and the ion concentration around the bubbles increases. After several minutes of compression, so many access ions are formed that free radicals are created.